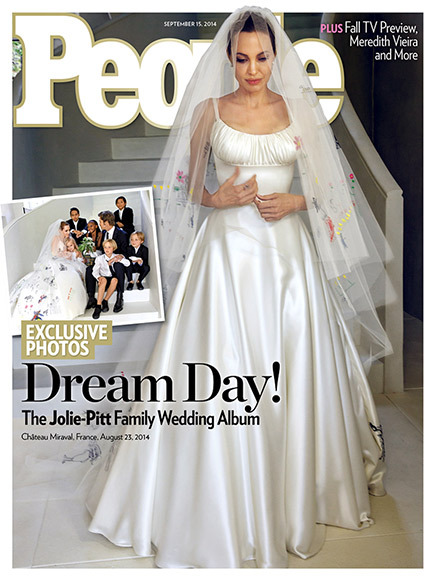 A Jolie-Pitt Family Wedding | Oh Sarah O ! I know that by now the Angelina Jolie & Brad Pitt wedding is old news, but can we talk about it for a minute!? I love the fact that Angelina kept her Valentino wedding dress simple but then went for a statement veil with embroideries of her children's drawings. Overall, it sounded like their French wedding was all about their family with a heavy focus on the kids which I thought was really great. What did you think of Angelina's dress/veil and the wedding itself? Let me know in the comments below.